Scheduling meetings is a breeze with our Outlook add-in. You can schedule Jiminny meetings directly from your Outlook calendar. To use the plugin, you must be on a supported version of Outlook. If your organization has not pre-installed the add-in, you can do this yourself. 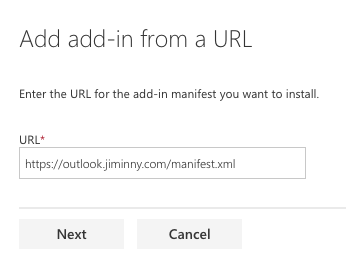 When creating a meeting in your Outlook client, you'll have a new Jiminny button. The first time you click the button, it will ask you to login to your Jiminny account. Once that step is complete, clicking the icon will populate your meeting details in the meeting invitation.